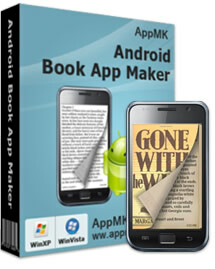 Android Book app Maker converts Word and/or **** files to flipping Book app for Android. It allows you to insert illustrations, custom look & feel, even change ********, setup **** protection and eyesight-protection. You can easily create Android app without programming knowledge. It is the best choice if you want to make Ad income. The out apps as standalone programs, they run in the Android-powered devices independently with search, bookmark, and Book info options integrated. You can reedit it after save settings as project at any time and place. Build Android app with common **** files. (2) Create chapters one by one though copying paragraphs of content in editing panel for being reedited. Support common **** encoding: Windows (ANSI), ASCII, Unicode, UTF-7, Big Endian Unicode, UTF-8 etc. Built-in **** editing tools enable publishers to select all, cut, copy, remove the non-paragraph line breaks, save matter. Fast divide one chapter into multiple chapters ****d on a *** word such as "Chapter" . Extract the selected **** as a new chapter. It enables you to custom Book icon (will appear on Android screen) and Book cover (when start the Book app which has been installed). Allows you to predefine font, font size, lines pace, even font or background color which initially shown after you open the output Book app in Android. Encrypt content of Book in case someone extracts it from the output APK file. Support insert pictures for illustrating. The international option supports customize ******** explanations replacing the default English for different ******** users. Automatically save the current uncompleted Book for further quick importing and editing. The built-in ***Store registration assists you to settle the issue of Android digital certificate (Android apps require digital sign). Two reading modes scroll and flip are available for you. You can embed Admob ads into Android Book apps to earn ads commission fee. Enables you to add bookmark. You can read Book app online or offline once it installed. The design of Book thickness makes the Book app look life-like and reading interesting. The flipping effect looks more vivid and perfect than the previous version. The bottom of each page of Book app shows the reading percen***e, chapter name and current time. Dance your finger on the touch screen to flip over the Book app from left to right or oppositely. If the publisher encrypted the Book app, nobody can extract content from it. The Previous and Next buttons facilitate flipping action. Slight click the center of Android device screen to open the basic setting icons combination: Previous, Next, Catalog, Day/Night, Config and About. Config: define font size, line space, screen light turning on/off when reading, Book basic information. Day/ night: beautiful parchment ****ure as background, also you can modify the font color and size. about: Check out Book app basic information such as name, author, category, de******ion, etc. If publisher embed Admob ads, you will see the animated ads on the top of each page. The hyperlinks in content are all preserved. You can enjoy the illustrations in flipping page. Read the Book app on both online and offline condition. Down-up finger sliding lead to page scrolling, also you can click the buttons of top previous or bottom next. Slight click center of touch screen to open the setting combination: Previous, Next, Catalog, Day/Night, Config and About. If Book app content was encrypted, nobody can extract from it. Click icon of Catalog, you can check out all the chapters. "Previous" button on top directs to the last chapter. "Next" button on bottom leads to next chapter. Config: custom font size, line space, font and background colors. Day/ night: switch reading modes between day and night by change font and background color. about: collect the Book information of such as name, author, category, de******ion, etc to show you. If embed Admob ads, when you reading Book app, you will view the animated ads on top. The hyperlinks on the Book app content are valid.